find the best products for your home. a free perfect fit measure on every order. Have total control over the amount of light that enters your home. Protect your furniture, rugs and maintain your privacy. roller shades are the perfect choice for any room. so you can find just the right design for your home. beautiful effects with diffused natural light. 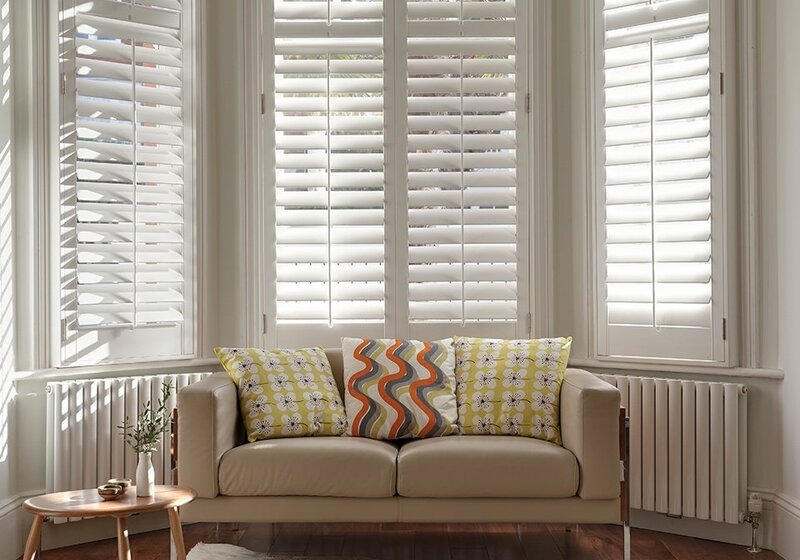 Known for their warm and sophisticated feel, shutters are considered a fine piece of furniture. Shutters add value and security to your home. 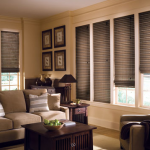 Wood and faux wood blinds are known for their versatility and simplistic look and feel. These blinds come in a variety of styles, and are considered an economical yet functional way to cover just about any window. There are a number of choices when it comes to vertical shades including sleek contemporary panel designs to custom vertical blinds with a large selection of colors, textures, and patterns in fabric, vinyl, and aluminum. 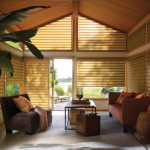 Honeycomb cellular shades come in a wide variety of fabrics, colors, and lifting systems. 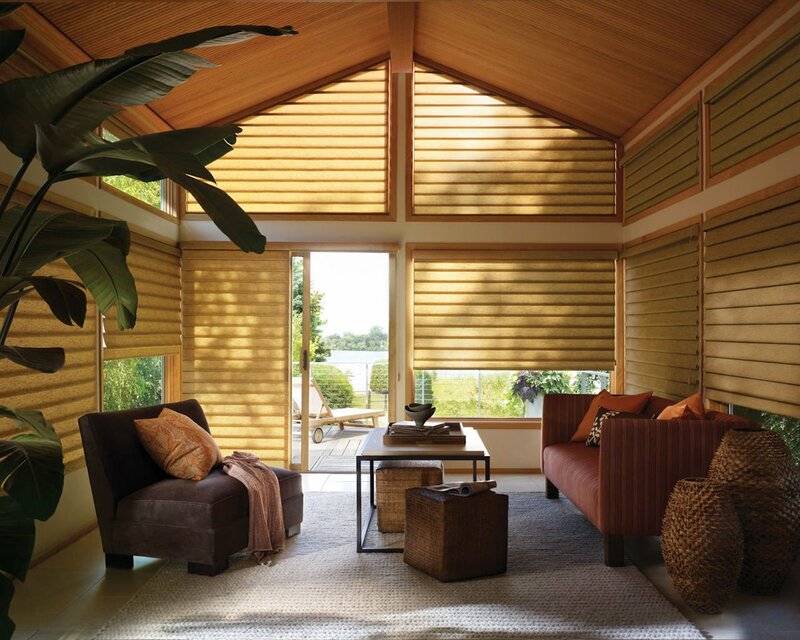 These shades can be very efficient when it comes to blocking heat and cold, especially with Hunter Douglas Duettes. Privacy sheers are a great way to diffuse harsh sunlight, draw natural light further into a room, and to achieve your desired level of privacy with beautiful, stylish, and innovative products. 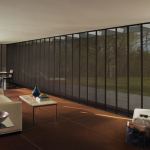 Roller or screen shades offer a clean, contemporary look that works for just about any room. We offer an impressive range of sturdy and distinctly beautiful fabrics and colors. Roman shades offer an elegantly tailored and modern look. 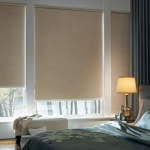 These shades have soft, sculpted folds that come in many fabrics and colors from light filtering to room darkening. Woven from versatile, light-filtering reeds, grasses and woods, woven wood shades come in multiple styles and transform sunlight into captivating designs. Woven textures are an innovative alternative to woven woods with uniquely blended fibers and sophisticated designs to create distinctive light filtering fabrics. 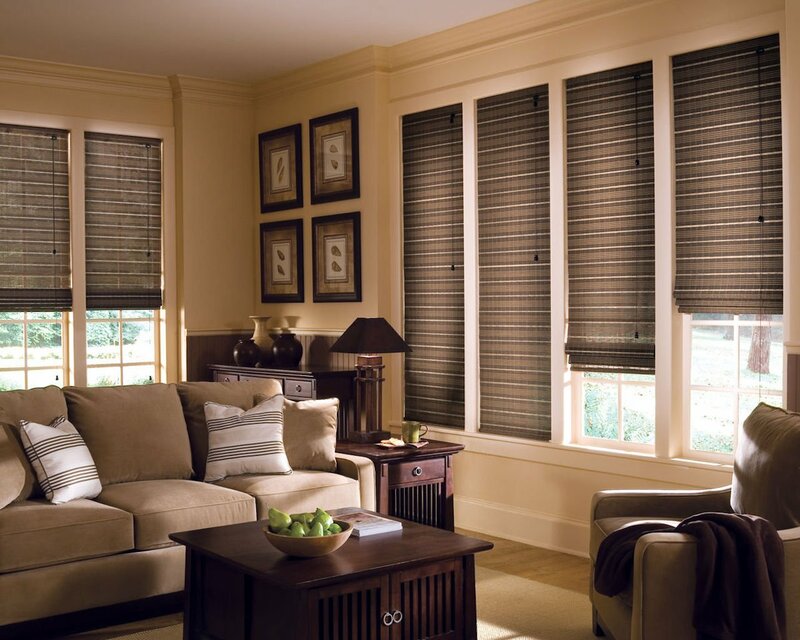 The experts at The Blind and Shutter Store will help you find the best window treatment products for your home. We are committed to your experience and offer a free perfect-fit measure on every order. We back our products with a limited lifetime warranty (please call for warranty details). 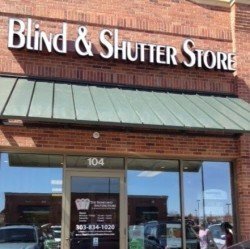 At The Blind and Shutter Store we’ll give you the attention and personal service you’ll come to expect and enjoy. 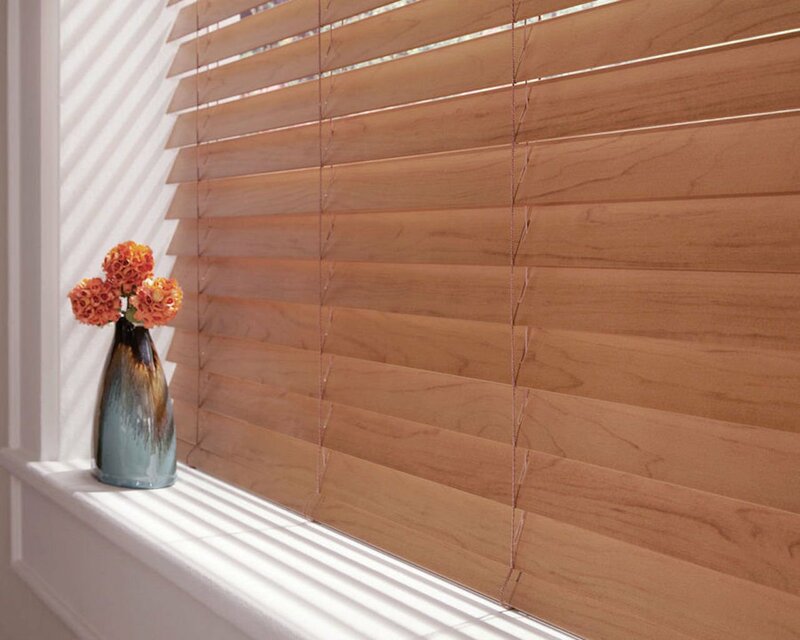 At the Blinds and Shutter Store, we offer high-quality, safe window treatments that deliver dramatic style and ultimate light and privacy control. Your Denver area home is one of your greatest investments, and we want to help you find the window treatments that are the perfect fit for your family without the stress-free environment. Visit our Denver area showroom to experience the wide selection of window coverings we offer.